Darjeeling: It was a scene of old war horses running together in the ongoing Teesta Rangeet Tourist Festival 2017, where the Darjeeling Himalayan Railway and vintage Land Rovers ran side-by-side on Thursday in a colorful rally. While the DHR is a world heritage, the land Rover owners have appealed to the government to declare these vintage vehicles as heritage also. 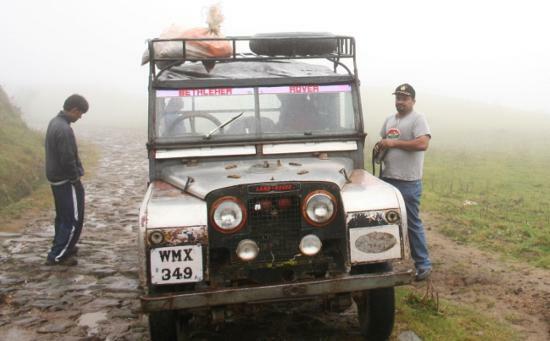 A Land Rover rally commenced from Maneybhanjyang, 28 km from Darjeeling town. At Ghoom, 8km away from Darjeeling town, a DHR carnival train joined in and completed the epic journey running next to the vintage SUVs. Maneybhanjyang, a hamlet on the Indo-Nepal border, 28 km from Darjeeling, could be the only place on this planet where the residents are dependent on a fleet of vintage vehicles, both as a daily necessity as well as livelihood. The hamlet boasts of 42 fighting fit Land Rovers, each more than 50 years old. These are the only vehicles that are used to ferry both passengers as well as goods to the famous trekking spot of Sandakphu, at an altitude of around 12,000 feet, as well as the numerous villages en-route. The residents of these villages are dependent on the Land Rovers for the transportation of nearly everything, from construction material, essential commodities including LPG cylinders and food supply. The Land Rovers of Maneybhanjyang have been manufactured before 1957. "The government should recognise these vehicles as heritage and make special provisions for them. As spare parts are not available, these vehicles have seen a lot of modifications. These vintage vehicles cannot be judged on the same yardstick as prevailing government norms such as emission fitness. If these vehicles are taken off the road, then an important part of history will disappear," stated Asish Gupta, who is a Land Rover Instructor from Delhi and had taken part in the rally, along with his family. Maneybhanjyang offered discounted stays to tourists on December 27, with cultural shows and felicitation programmes being held as part of the festival. "70-year-old Radhey Tamang, who still continues to drive a Land Rover, ferrying tourists to Sandakphu and 65-year-old Phurba Tamang, a Singhalila National Park tourist guide, were felicitated," said Buddha Tamang, organiser of the event. While the DHR is a world heritage, the land Rover owners have appealed to the government to declare these vintage vehicles as heritage also.